The news that the world has been awaiting was announced recently by the Vatican. 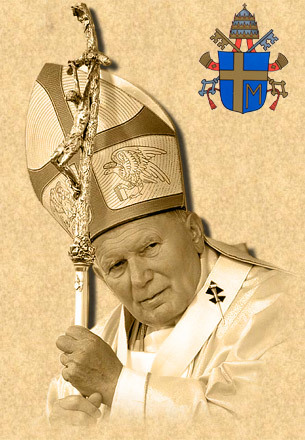 Pope John Paul II will be beatified on Divine Mercy Sunday – May 1, 2011. Beatification is one of the steps towards sainthood – first a person is declared venerable; then with beatification the person is elevated to the status of blessed; the highest status is that of a saint, which is recognized by the Church through canonization. 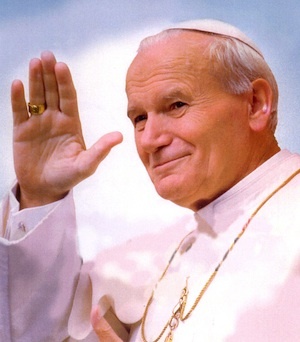 The choice of Divine Mercy Sunday for the beatification of John Paul II has particular significance. Who can forget the day of John Paul's passing from this earth? There were immense crowds of worshipers in St. Peter's Square praying for His Holiness. The news – though it was anticipated – came as a shock. He passed away on the vigil of Divine Mercy Sunday in 2005, less than six years ago – April 2, 2005. Divine Mercy Sunday is celebrated on the Sunday after Easter. It was officially instituted by Pope John Paul II on April 30, 2000 – which was itself the first Divine Mercy Sunday of the new millennium. The celebration of Divine Mercy Sunday comes to us through the revelations of Sister Maria Faustina Kowalska. She was beatified by Pope John Paul II on April 18, 1993, and was canonized on April 30, 2000. It was during her canonization ceremony that John Paul announced the official recognition of Divine Mercy Sunday by the Catholic Church. He pronounced, "It is important that we accept the whole message that comes to us from the word of God on this Second Sunday of Easter, which from now on throughout the Church will be called 'Divine Mercy Sunday.' "
"Mercy" was an early theme of John Paul's pontificate. His second encyclical, released on November 30, 1980, was titled "Dives in misericordia" ("Rich in Mercy"). Early on in this encyclical he reminds us of the words of St. Paul to the Ephesians. "Among these we all once lived in the passions of our flesh, following the desires of body and mind, and so we were by nature children of wrath, like the rest of mankind. But God, who is rich in mercy, out of the great love with which he loved us, even when we were dead through our trespasses, made us alive together with Christ (by grace you have been saved), and raised us up with him, and made us sit with him in the heavenly places in Christ Jesus, that in the coming ages he might show the immeasurable riches of his grace in kindness toward us in Christ Jesus. For by grace you have been saved through faith; and this is not your own doing, it is the gift of God -- not because of works, lest any man should boast." As the Pope points out, the concepts of grace and mercy are antithetical to our modern mentality. The present-day mentality, more perhaps than that of people in the past, seems opposed to a God of mercy, and in fact tends to exclude from life and to remove from the human heart the very idea of mercy. The word and the concept of "mercy" seem to cause uneasiness in man, who, thanks to the enormous development of science and technology, never before known in history, has become the master of the earth and has subdued and dominated it. The truth, revealed in Christ, about God the "Father of mercies," enables us to "see" Him as particularly close to man especially when man is suffering, when he is under threat at the very heart of his existence and dignity. And this is why, in the situation of the Church and the world today, many individuals and groups guided by a lively sense of faith are turning, I would say almost spontaneously, to the mercy of God. They are certainly being moved to do this by Christ Himself, who through His Spirit works within human hearts. "Mercy" raises many question marks to our modern way of thinking. How can someone receive something just by asking for it? Shouldn't that person have to earn it? And because of our culture's aversion to God himself, we naturally have questions like: Shouldn't Man be the source of mercy, rather than God? Is there some way for me to obtain mercy without having to go through God? Mercy is equally troublesome because it is wrapped up in the concepts of grace and faith. But if we can fight our way through all that confusion that has been planted in our minds by the secular world, then we can begin to find the tranquil path which leads us closer to him; towards His infinite Divine Mercy. And then finally we begin to understand that Mercy is Love; Love is Mercy. Compare the words of Pope John Paul II at the canonization of St. Faustina with those of Luke 10:27. By this act of canonization of Sr. Faustina I intend today to pass this message on to the third millennium. I pass it on to all people, so that they will learn to know ever better the true face of God and the true face of their neighbor. In fact, love of God and love of one's neighbor are inseparable. We give God our Love, He showers us with His Mercy. On May 13, 1981 Pope John Paul II nearly lost his life at the hands of an assassin's bullet. During his convalescence it is reported that he had the Diary of Sister Faustina read to him in Polish. His first trip outside of Rome following his recovery was to the Shrine of Merciful Love in Collevalenza, Italy on November 22, 1981. It was a year after he had published his encyclical on mercy which he later revealed to be inspired by St. Faustina's writings. There he delivered these words. "A year ago I published the encyclical Dives in Misericordia. This circumstance made me come to the Sanctuary of Merciful Love today. By my presence I wish to reconfirm, in a way, the message of that encyclical. I wish to read it again and deliver it again. Right from the beginning of my ministry in St. Peter’s See in Rome, I considered this message [Divine Mercy] my special task. Providence has assigned it to me in the present situation of man, the Church and the world. It could be said that precisely this situation assigned that message to me as my task before God." It should be understood also that St. Faustina's vision of Divine Mercy has an apocalyptic component. In the revelations she received it was explained to her that this gift of Divine Mercy was a last hope for His people before the coming wrath of God. Pope John Paul II was certainly aware of this, which makes his message all the more vital. Canonization of St. Faustina - "a gift of God for our time"